Jump right into the Happy Trails newsletter back issues! "Why would this free Happy Trails newsletter be of any use to me?" "I always look forward to your messages in my inbox. Some make me laugh, others make me think deeper, but I always end up learning something new about being in the woods with Mother Nature, especially as a female solo hiker." I'm guessing that no matter where you fall in the spectrum of outdoor enthusiasts, you'd be open to some of the best hiking tips for women hikers. There are so many ways to hike! And I'd love to share fresh hiking and backpacking news with you! Because I am completely, shamelessly addicted to hiking. And I tell anyone who will listen about the good stuff I learn about hiking. learn a lot about being a prepared, strong, smart hiking woman simply by being out there, hiking and bush wacking and scrambling and exploring and keeping notes on what to improve! All of that devotion to hiking adds up to a woman who is bursting to share with other hikers. And to show you how dedicated I am, here's a photo of me in my "office" (on Banshee Peak, near Mt. Rainier). Doing some seriously deep thinking about the next issue of the Happy Trails newsletter! So here's where you come into the picture. Where do you get your up to date information on hiking? Who do you turn to when you have a hiking question? When you need new hiking gear, do you have a trusted source for reviews? information about the latest hiking gear, the newest research findings in nutrition and medical research (yes, I admit it - I read geeky medical journals), and great places to explore. Although it's packed with information, this brief monthly update is quick to skim and digest, so reading Happy Trails won't eat into your trail time. Here's a sampling of what you will find in a quick-to-read format. I might critique the book I just finished about the outdoors, or a book I know is important for skill building. Maybe I'll provide a summary of a research article on hiking nutrition. Or share a hot tip on a brand new hiking resource. And I'm always on the look out for sources of hiking information, making your suggestions for a review in the newsletter both welcome and appreciated. So much fun, new and high tech stuff, so little time. Some of it is over-the-top expensive, some of it is just hype, but once in awhile I stumble across something worthwhile. It could be something as small as a new remedy for bug bites, or something as big/expensive as a camera or pack. I will only pass along what I myself have tried, or what someone I trust on the trail has tried. And it doesn't always have to be geeky! Even a bandanna is considered a worthy piece of gear when used in a unique way, in my opinion. insights I've stumbled across in my virtual and physical wanderings. You won't miss a thing if you subscribe to the Happy Trails newsletter, because all new articles are in one handy spot. You can read them at your leisure. Send me your question, and I can share it, along with my answer. If you're wondering, plenty of other hikers are, too! Let's enjoy each other's curiosity and thirst for knowledge. And it satisfies my retired teacher persona, too. I'm very familiar with question and answer sessions from my decades in the classroom. If you've got a hot tip or some trail advice, I'd be happy to share it with our community of trail buddies. Don't be shy - pay it forward! I belong to 5 different hiking groups. We hike all year long in all kinds of weather... we use your information and survive our day hikes." As you can see, I'm always busy gathering hiking tidbits to keep all of your trail time happy - and that's exactly how I arrived at the name Happy Trails. By using all of the monthly information at your fingertips, you'll hike with a smile on your face. So please consider joining me every month virtually via the Happy Trails newsletter. I will NOT sell or share your email address. There's nothing worse than getting unsolicited newsletters or spam. And as easy as it is to sign up, I make it even easier to opt out if it's not your cup of tea. Just follow the instructions at the bottom of the newsletter, and your email address will be purged from the mailing list. Outstanding in my boulder field. Won't you join me? If you'd rather connect on a more frequent basis, visit the Hiking For Her Facebook page. welcome your comments and insights. 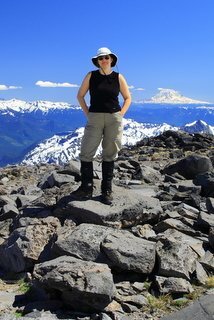 There's a HFH Pinterest page with lots of female hiking topics to explore, too. Plus a HFH Instagram page where you can see photos I don't share on this website. Use this handy little green box. And I'll see you next month! 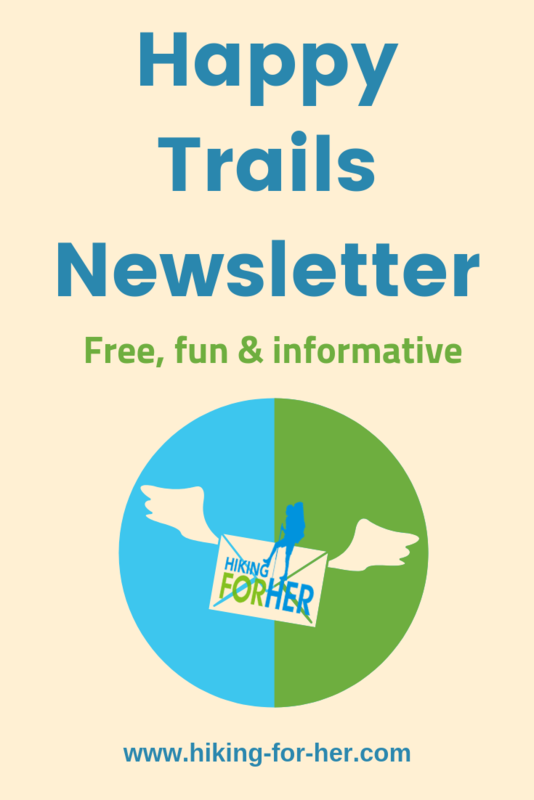 I understand that you will use my information to send me the free monthly Happy Trails newsletter, and that I can unsubscribe at any time using a link at the bottom of each newsletter.